The U.S. attorney general ordered prosecutors to seek the death penalty against mobster Joel (Joe Waverly) Cacace for ordering the murder of an NYPD cop, officials said in a New York Daily News article. Cacace, 69, a former acting boss for the Colombo crime family, is charged with putting a contract on Officer Ralph Dols after the cop married the mobster's ex-wife. Joe Waverly survived two attempts on his life. Dols was off duty when he was gunned down outside his home in Brockton in 1997. Attorney General Eric Holder declined to seek the death penalty against former Colombo boss Thomas (Tommy Shots) Gioeli and soldier Dino (Little Dino) Saracino, who are also charged in the ambush slay. It is rare for the feds to seek the death penalty against a mafioso, but according to the government's theory, Dols was killed because he was a cop and not over a mob dispute. Cacace's lawyer blasted the decision, calling it a "legal and ethical disgrace." The star witness against Cacace will be former capo Dino (Big Dino) Calabro, who was part of the hit team and is now cooperating with the feds. If killing a cop weren't enough, Cacace also set in motion a hit that ended with the death of the wrong person -- the father of a prosecutor whom Carmine Persico wanted dead. The father himself was a judge. In 2003, Cacace was finally charged with the March 1987 murder of George Aronwald, the father of a onetime mob prosecutor; he was shot to death in a Queens laundry by mistake. The key witness against Cacace in that case was Lucchese associate Frank Smith, the only surviving member of the hit team that intended to kill Aronwald’s son William, a former federal prosecutor who had been marked for death by the jailed-for-life Colombo boss, Carmine Persico. Smith's two cohorts in the slaying, Vincent Carini and his brother Enrico (Eddie), were killed a few months later, as was the hit team who took them out, all part of Cacace's efforts to hide his fingerprints. According to court records, Smith reached out to a Lucchese soldier he knew, and after two sitdowns between the Colombo and Lucchese families, the Colombos agreed to spare Smith. February 1992, during the Colombo War, Cacace was ambushed and shot outside a social club in the Sheepshead Bay section of Brooklyn. Cacace was a supporter of Vic Orena, who was challenging Carmine Persico for control of the family. During the attack, two gunmen fired 14 shots at Cacace. Although wounded, Cacace drew a handgun and fired back. As the Colombo war progressed, Cacace switched back to the Persico faction, which ultimately won. 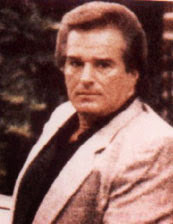 Despite his current problems, Cacace is one of the few members of the Colombo war that wasn't killed or sent to prison for life. But he was badly wounded, as previously mentioned, and not for the first time. Cacace had received a gunshot wound prior to the Colombo war, back in 1976, when he was ambushed by three robbers near his florist shop in Brooklyn. After being shot in the chest, Cacace wrestled a handgun from one of the robbers, shooting one of them dead in the process. The remaining robbers fled the scene and the critically wounded Cacace drove to a local police station with the robber's bloodied corpse in the backseat. Overall, he is believed to have been shot in the chest several times in his life of crime thanks to those two incidents. But ironically, an IV injection may be the weapon that does him in, not a rival's bullet.